Few people knew of the existence of these buildings, which were hidden from view in the triangle formed by the top ends of Albion Hill, Richmond Street and Liverpool Street. A narrow lane approached them from 116 Albion Hill, which is still there but now leads to a modern bungalow. Chate’s Dairy was established here in the 1860s and the cows were grazed on land across Albion Hill, where Grove Street is now. This street was not built until 1894, many years later than all the neighbouring streets. 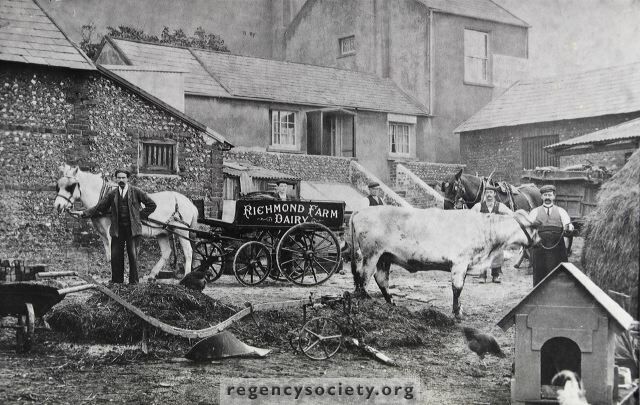 The cows were then taken to graze on Tarner’s land, off Richmond Street, which in turn was built over in 1930. The Chate family lived in the house seen in the photograph, 34 Richmond Street, with stables and cow stalls adjoining. Delivery of milk ceased with the 1914 –18 War but customers were still served at the premises until about 1924. The farm buildings still exist but are now used as garages. Date of photograph 1904.